What types of chemicals do you use and are they safe for my family and pets? We offer environmentally safe option whenever possible. Will I need to leave the property during treatments? a concern for you please mention this to Clifton Pest Management as alternative treatments may be available. Do you offer a guarantee on the work? Yes – most of our work comes with a guarantee. This will always be fully explained prior to the work being undertaken. The Health Department recommends inspections at no longer than 12 month intervals. Is there a best time of year to get a termite inspection? No – termites are active and hungry year round. General pest treatments for spiders, ants, cockroaches, rats, mice, bees, wasps, fleas, silverfish and carpet beetles. My house was inspected 20 years ago when I bought it – why do I need another inspection? Termites can attack at any time – an inspection does not prevent termite attack. What is the difference between termites and white ants? There is no difference – white ants are the commonly used name for subterranean termites. I have termites in a tree stump next to my house, do I need a treatment? It would be wise to have the property inspected and consider your options. I had a full treatment about five years ago. I was told it would last about 10 years – is that right? This depends on the chemical the home was treated with and at what consistency the chemical was applied. My neighbour has had a big problem with termites – is my house safe? It would be wise to have an inspection of the home and discuss prevention/management options. 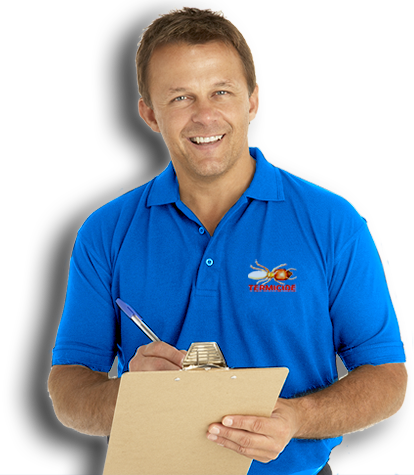 How do Termicide’s Prices compare with other Pest Control Companies? From a recent ‘like for like’ price and service comparison Termicide consistently outperformed competing companies.